Dip & Flip isn’t fine dining. It’s junk food, in the best possible way; food to tear apart and tuck into, food to lick off your fingers and dribble down your chin. The retro Americana themed diner has a unique way of avoiding a dry sarnie – everything on the menu is served with a side of gravy for you to dip, double dip, or soak your meal in. It’s a great little feature, and much more than a gimmick. They’re gravy-crazy in Dip & Flip, with love for the brown stuff plastered all over the walls. And so it should be, the gravy adds a unique centrepiece for the meal, making the whole thing feel more communal and relaxed. First up is a lamb and mint sauce slider (American for small sandwich in a roll). The pulled lamb comes in great chunks, perfectly lifted by the light tang of the pickle, cabbage slaw and generous mint sauce. When you dunk it in the lamb gravy boat, you come up with a rich, sloppy mess of deliciousness. It dribbles everywhere but works wonderfully, like a perfect Boxing Day sandwich with all the sauces. Next up is a Sriracha patty melt, a double-cheese toastie on wholegrain, with a medium-rare burger patty smushed in the middle. Dipping it into the beef gravy elevates it from banging toastie to something soulful and comforting. At this point, the meat sweats are about to begin. Luckily, the drinks are light and compliment the meat feast well. The Hawaiian Big Wave beer is refreshing, while the jowl-wateringly tart pickleback shots (whisky with a pickle chaser) could generously be called palette cleansers. Though the mains are hearty and delicious, the dessert almost steals the show. It’s a Bailey’s cheesecake, frothy with licks of caramel and chunks of biscuit (and of course, cream liqueur). Thankfully, we aren’t expected to dip it in gravy – it’s perfect as it is. None of Dip & Flip is classic or boring in any way. It’s food that’s made to be shared and enjoyed, to cure your hangover or set you up for the night. To be torn, dunked, slurped and dipped. In short, to be thoroughly enjoyed. 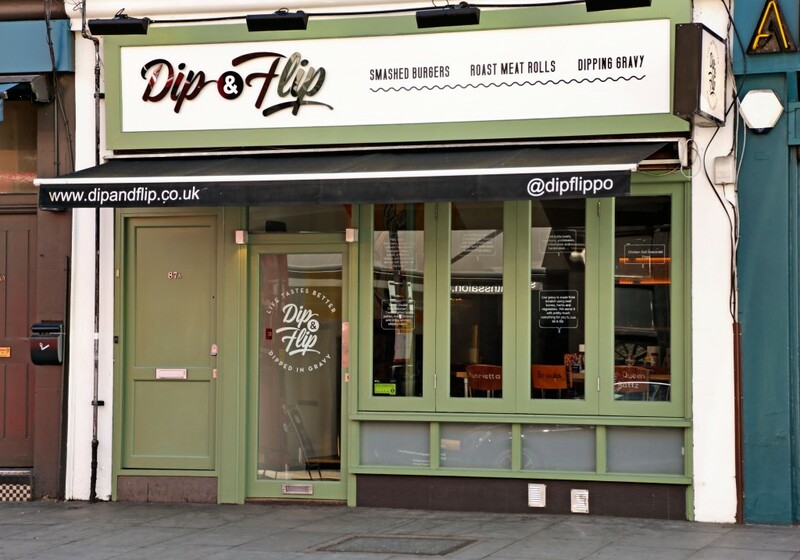 Dip & Flip Battersea is at 87 Battersea Rise, London, SW11 1HW. There are three other branches in Brixton, Tooting and Wimbledon.